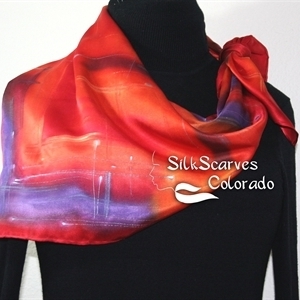 This category features hand painted silk scarves on a luxurious silk fabric - Silk Satin. It is a 100% silk fabric that has a more substantial weight, featuring a great drape and flow. Silk Satin feels lush and silky with a beautiful shine. It bears all colors gracefully and makes unique silk shawls for more formal outfits.